It’s not often that I get genuinely intrigued by a new car. Excited, certainly, and sometimes even curious, but real intrigue is becoming something of a rarity in the modern car market. Thatís not because manufacturers arenít doing new and interesting things ñ automotive innovation is arguably at its zenith ñ but because they all seem to be doing new things in much the same way. DS Automobiles, however, seems to be taking a slightly different approach. Since it broke away from CitroÎn back in 2014, the Parisian luxury brand has been trying desperately to differentiate itself, not just from Audi, Mercedes-Benz and their premium-market cronies, but from its sister brands. My new long-termer, though, is the first DS to be designed specifically for the new brand. The 3, 4 and 5 were all just CitroÎns with new nose art, but the 7 Crossback is a bona fide DS. For that reason, itís a car that fascinated me for some time, but by a cruel twist of fate (or perhaps a holiday, I forget which) I hadnít actually driven one. Then KW67 FGX rolled up on my drive, looking resplendent in its Perla Nera Black paintwork. That, combined with the 19-inch alloy wheels and dark detailing around the grille and rear light clusters, gives the car plenty of presence ñ a polite way of translating a friendís description, which included the words ìdrug-dealerís wet dreamî, plus a few expletives. DS 7s over a six-month period, rising through the range with every vehicle change. So for the first two months, Iím in the second-from-bottom model: the Performance Line. This is designed to be the sportiest version in the DS 7 line-up, with Alcantara lining the cabin and the white, red and gold badging that was pinched from the DS 3 Performance hot hatch. And as befits that status, weíve gone for the most powerful diesel engine on offer. Itís the 174bhp 2.0-litre, four-cylinder BlueHDi unit, which feeds power to the front wheels via an eight-speed automatic gearbox. As a result, this car will supposedly hit 134mph at full chat, but if youíre gentle, it could return 57.6mpg and CO2 emissions of 128g/km. 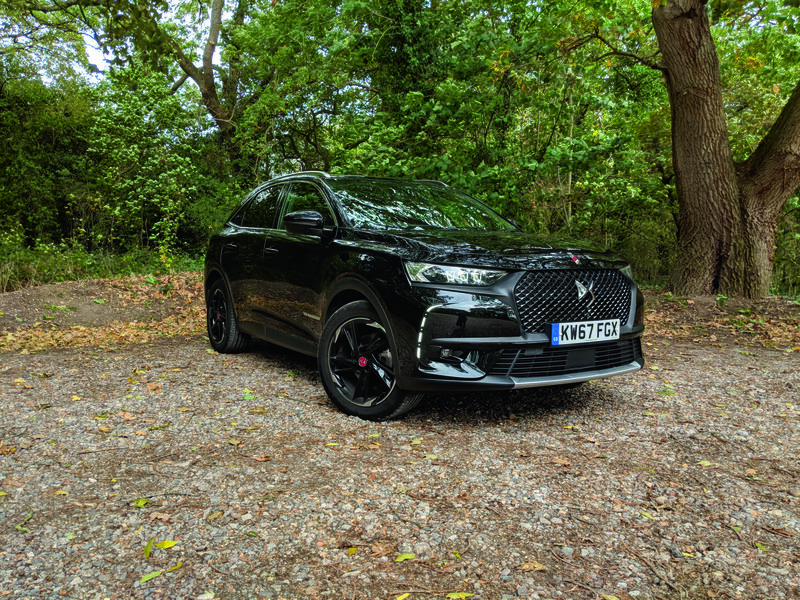 That puts the French upstart ahead of the equivalent Audi Q5 in terms of economy, although that car does have four-wheel drive and the DS doesnít. The basic Performance Line car costs a shade less than £31,500, but our carís options ñ namely the punchier engine, paint and clever tailgate with hands-free opening ñ brings our car to the thick end of £38,000. Nevertheless, thatís the going rate for a car such as this, and you do get plenty for your money. A navigation system, dual-zone climate control and keyless start are pretty much a given, but LED headlights, a 12.3-inch digital instrument cluster and clever suspension that scans the road ahead is above and beyond the norm. It sounds good, and after just a few weeks together, the initial impressions have been largely positive. The cabin feels streets ahead of anything DS has done before, with lots of soft materials, plenty of space and massive high-tech screens. It seems to have that wafty French ride quality, too, particularly in the aptly named Comfort mode. Some aspects of DS ownership, however, havenít been as smooth as the suspension. One morning, the carís on-board computers threw a wobbler and decided there was a fault with the airbags and seatbelt pre-tensioners. Then, as I took the car into DSís Manchester store, I noticed that the dusk sensor for the automatic headlights had failed. Fortunately, the dealer fixed it that day by resetting the computers, although the unwelcome excursion did rob me of an afternoon. That aside, though, Iím largely encouraged by my first few weeks with the Crossback, and Iím looking forward to getting to know the range better.